Phi Derivation - the 'Stringularity Hypothesis'- & WHAT ABOUT CLIMATE CHANGE> >. Paradigm-change to a unifying framework embraces gratitude & reverence for life. 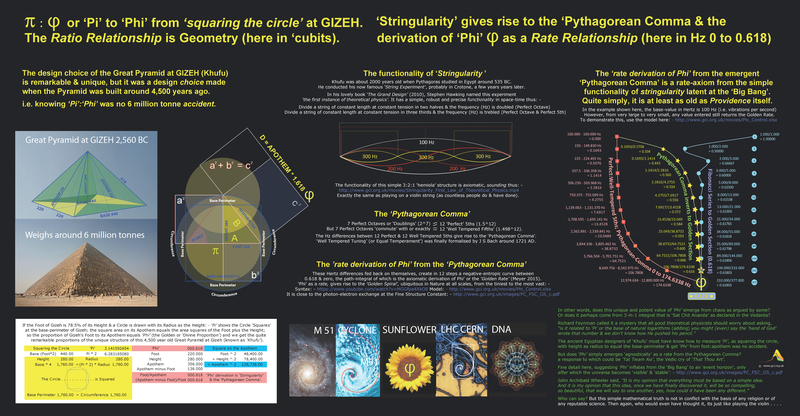 In a rationale that couples the irrationality of 'Phi' and the transcendence of 'Pi'. 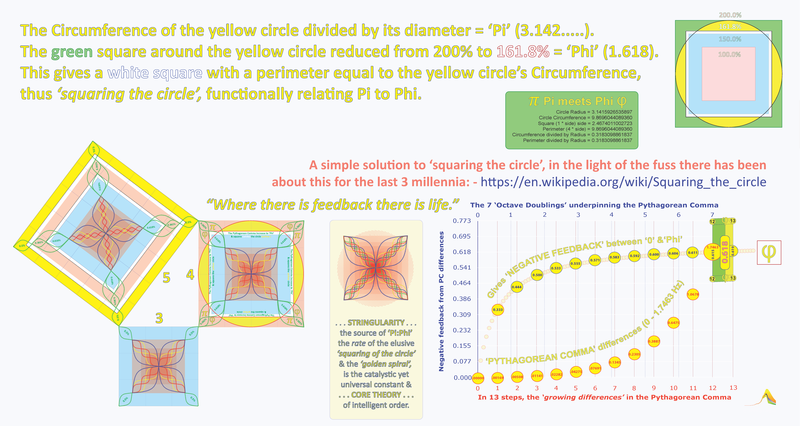 embeds a per-unit-time-based-derivation of the beautiful and irrational 'Phi'. ((the square root of 5 + 1)/2) or the Fibonacci Series (as in the Pentagon:Pentangle). ‘Phi’ is a point on a curve at the ‘Phi-point’, between steps 12 and 13 of the Pythagorean Comma. wave-fields are only probability perceptions still regarded as the ‘quantum measurement problem’. And that if we third the length of the string the frequency (Hz) trebles to 300 Hz etc . . . .
the ‘Perfect Octave plus the Perfect Fifth’ etc . . .
sub-division by any rational number will produce a 'harmonic' in this series . . . .
the difference is 283.62 Hz, yielding a value 0.6199396…. just above the value of ‘Phi. by acceleration (convexity) and unfold without limit towards infinity. feedback limits or concavity that define it, countervailing the convexity of acceleration. ‘Stringularity’ is distinct from the time-free quadratic equation and Fibonacci Series. This path-integral procedure gives rise to an array of time-based features which suggest corroboration. 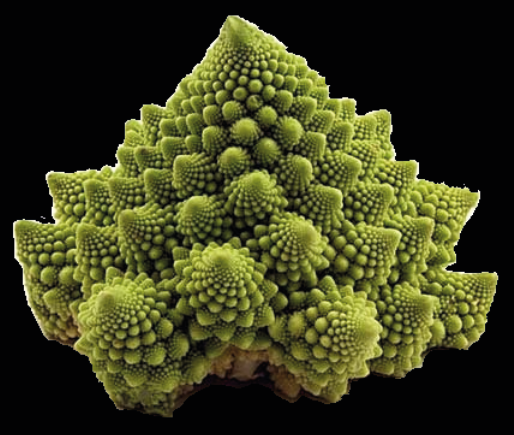 the symmetry and the curvature of natural phenomena, from the nanoscale to the macroscale. life:death challenges that will always face us? Concomitant corroboration . . . . ? 1. Seven Perfect Octaves (or Hz doublings) is about the length of a modern grand-piano keyboard. 2. This ‘non-commutation’ phenomenon has been recognized for Millennia. 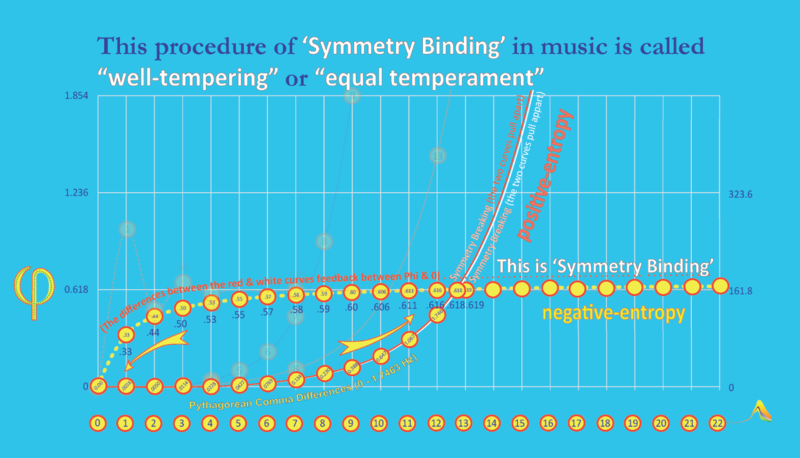 if 12 Well Tempered Fifths are 100%, 12 Perfect Fifths are always 101.36433…%. smoothed by the equality of the twelve semitone steps in the Perfect Octaves arising. 4. The classical example of this is the Well-Tempered Clavier of JS Bach (1721).